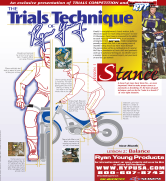 Trials and Enduro News has been publishing The Trials Technique of Ryan Young series of motorcycle trials tutorials beginning with the Feb, 2009 issue (then called Trials Competition newspaper). Finally! A straightforward, clearly written, fully illustrated guide to Trials riding technique! Six time US Champion Ryan Young is renowned for his ability to teach riders of all levels. Now, in an exclusive arrangement with RYP USA, Trials and Enduro News proudly presents this first in an ongoing series of monthly riding lessons by Flyin’ Ryan himself! The presentation will be as methodical as it is precise: We’ll lay a foundation of basic skills and gradually work up to advanced techniques. So whether you’re a newbie Novice or seasoned Expert, put your boots on and let’s get started!